If you are living with spider veins you don’t care what the clinical term is, you just want them to go away. These tiny blood vessels widen unnaturally causing threadlike reddish or purple patterns in the skin often resembling spider webs, which is how they got their name in the first place. 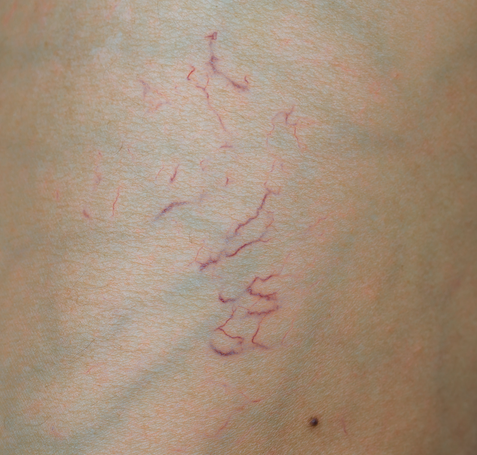 Spider veins are most common in areas such as the lips, nose, fingers, eyelids, and cheeks. They are visually distracting and can even cause discomfort. Because of this many choose removal. The removal procedure is done, ironically, by causing damage to the vessel and forcing it to collapse. This reduces the appearance of the color under the skin because it is no longer used or filled with blood. Most spider veins are harmless but they can also be a sign of illness so it is a good idea to see a Vein Specialist and get checked out. HHT Hereditary Hemorrhagic Telangiectasia is a rare condition passed down genetically and can be life-threatening because it can affect organs like the liver and cause massive bleeding. If your spider veins are uncomfortable in ways such as pain, itching, or achy legs, that is a sign they might be more than just a visual annoyance. The exact cause is unknown. Researchers believe they may be genetic, environmental, or even a combination of both. Most cases of spider veins are caused by an ongoing exposure to the sun or extreme temperatures. Diagnosis can only be made by a qualified Vein Specialist such as Dr. Mark Zuzga at the West Florida Vein Center. The outlook is great for patients who seek treatment, so give us a call today 1-727-712-3233 or visit us online at www.westfloridaveincenter.com.